Serendipitous Equine Discoveries, Bargains, Treasures…Look what I found! the pic is the Presentation Model, it is rare. was made in the 70s, i dont have this model in particular but i was just using this pic as an example of what he looks like. Are the proportions real? (In the Man O' War piece.) The head and neck look too big and heavy for the body. Zenyatta seems more balanced, as seen in the picture below left. Her body and legs are long enough to balance her head and neck. i meant how my breyer model of Man O War looks like. not how he looks in real life. All the horse treasures that I have are Breyer models or Artist Resins and I'll have to admit that learning about the model horse images of the great race horses is another thing that drew me into horse racing. I have loved horses for as long as I can remember, but as a busy wife and mother of a growing family I managed to suppress that for a long, long time. In our store we started carrying the Breyer model horses because my youngest daughter turned out to be as horse crazy a little girl as I was. Long story trying to get cut shorter, I made a lot of friends who collected model horses and learned about the hobby and through the hobby I learned about race horses. Sad to admit, I wasn't aware of the great Cigar while he was racing his incredible undefeated streak, but only when his image was created as a model horse. I followed the triple crown races each spring, but didn't follow through with the racing that goes on the rest of the year back when I was so busy. Funny Cide got me going when he was starting his bid for the triple crown, but the next year when Smarty Jones came along, I was totally and completely in love!! 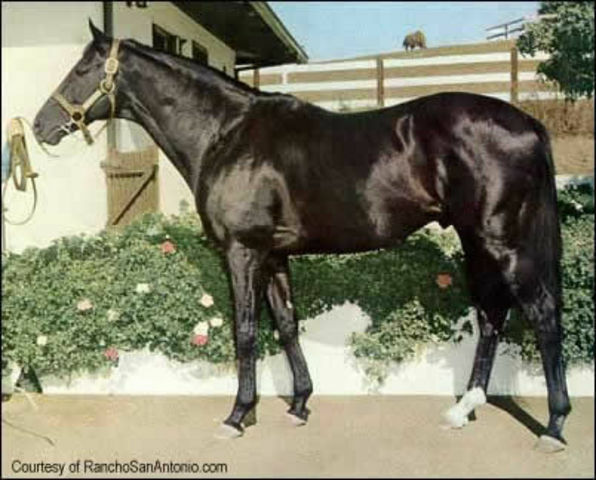 After we sold the store and I retired, I've had much more time to do the research and reading and learning about horse racing and somewhere along the line, there was this big dark filly racing out in California that caught my eye. Wow!! Now Zenyatta completely owns my heart - lol!! Sorry to be so wordy, but I was on my way to answering about the Man O War Breyer. That sculpture is not one of the best representations of the great horse. The Man O War that is in their classic scale was originally sculpted by Maureen Love for Hagen Renaker ceramics and is said to be a much better image of Big Red. Here's a link to the photo of the classic scale Man O War as sculpted by Maureen Love. My first purchase was of a foal...perhaps an Arab foal? idk. I purchased it (rather my parents picked it up) when I first visited Yosemite Park in 1961 at one of the park's gift shops. 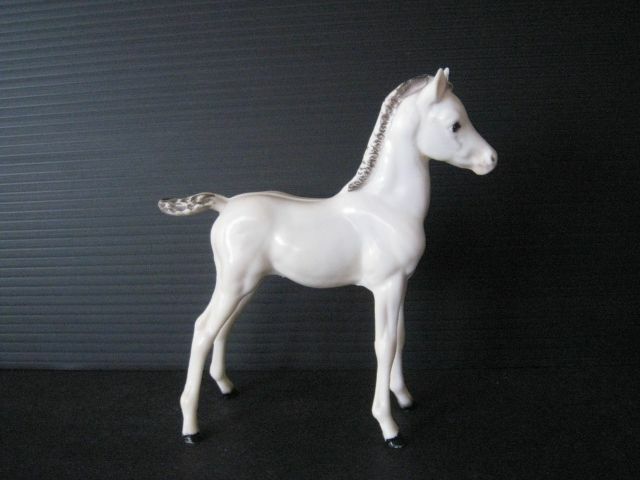 I tried looking for any Breyer raised markings on this piece but could not find any. idk...maybe it was made before 1960? 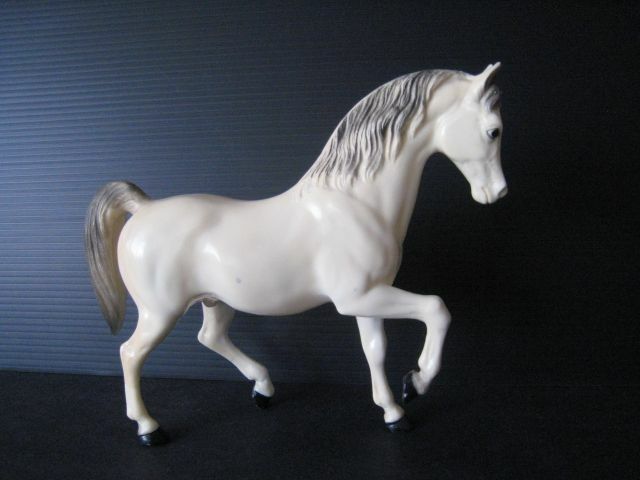 OK researched that it was a Breyer Old Mold of Proud Arabian Foal "Joy" (PAF) No. 9 in glossy alabaster. Years Released 1958-1959. This mold was pulled from production in the 1950’s due to a lawsuit with Hagen Renaker in California. The next Breyer I picked up was of an Arab mare at a toy store at Ala Moana Shopping Center called Jean-Lu (spelling idk) probably 1961-62. This mare has a raised marking saying Breyer Molding Co in a circular shape with a large "C" in the center. I can't seem to see the year...perhaps my bad eyesight? Found out it might be entitled: Pride No. 8 Arabian Mare in glossy alabaster production 1961-1973. Since I had a grey Arab mare and foal...I had to get a grey Arab stallion to complete the set! I believe I saved up my allowance and purchased this piece at Jean-Lu...probably 1962. This one has the raised Breyer Molding Co & "C"...can't find the year it was made. 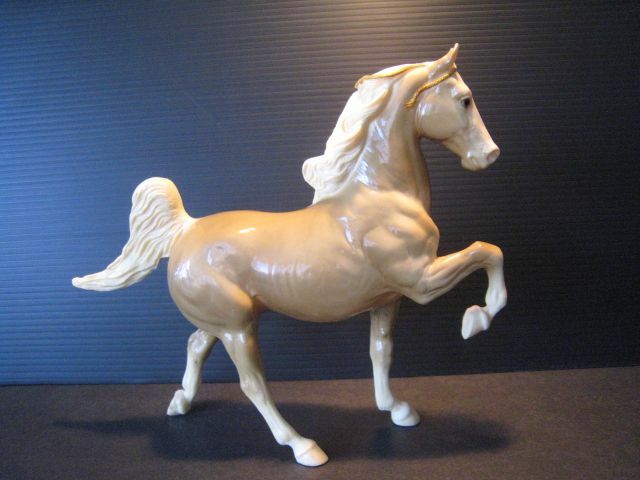 OK-found out the stallion is entitled: "Prince, Arabian Stallion model 7 in glossy alabaster 1959-1966 production. Are the breyer markings on the inside hind right leg? These days the breyer marking is a C with a circle around it with words around that "Breyer Reeves", no dates. I have that Arabian Prince mold, but mine is just a Palomino. They reuse mold poses for different horses, i had wished when they did Zenyatta that she would be dancing considering that is her signature identity. Yes, the maker's mark is inside the right hind leg. But the C is surrounded with the words Breyer Molding Co. instead. But the Arabian foal has no makers mark that I can find. I think during my research, Breyer didn't have the raised mark on their models before 1960...they used stickers or something like that instead. INTERESTING INFO ABOUT THE LAWSUIT: BREYER'S ARABIAN FILLY VS HAGEN RENAKER'S ZILLA! Throughout Breyer history they utilized others’ works as inspirations for their own. There is much good information out there on the subject, so this blog post is a look at some actual comparisons between Breyer and Hagen Renaker molds (the company will heretowith be referred to as HR to save me from early carpal-tunnel). A must-read for collectors is the book by Nancy Atkinson Young - Breyer Molds and Models. It’s the most accurate and detailed book on Breyer available. It is out of print, but there are second-hand copies available at a variety of web sites. 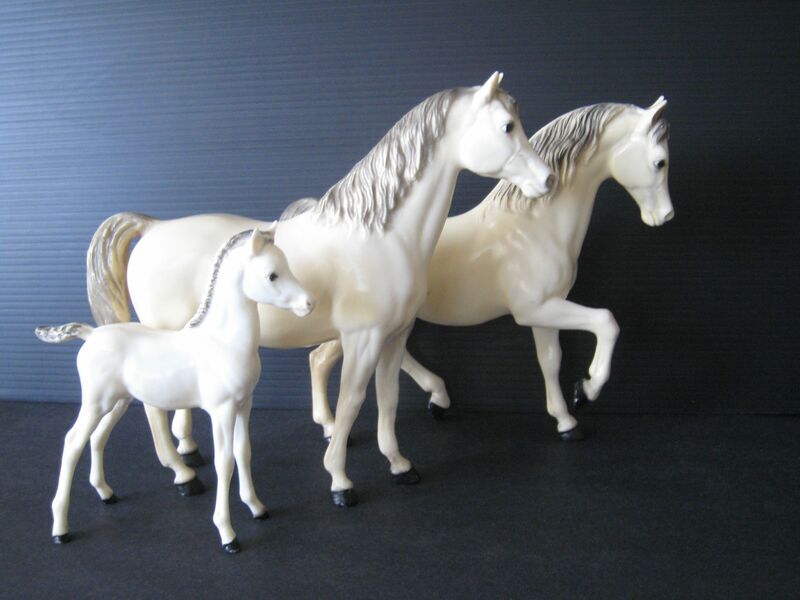 In 1958 Breyer wanted an Arabian horse family. Chris Hess promptly obliged, but unfortunately the horses he produced were suspiciously similar to a family produced by HR. The two firms went to court and HR won. The Proud Arab Mare and Foal were ruled as copies, and had to be discontinued. They were originally produced only about 1958-59. 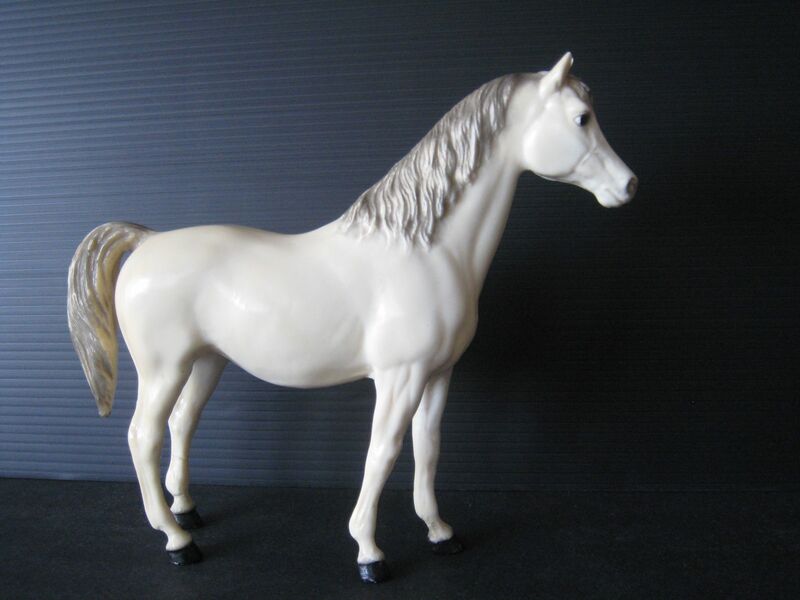 The Arabian Stallion was decided to be different enough from the source mold and was allowed to continue in production. Above: This is an example of the Breyer ‘Old Mold’ Proud Arabian Foal and the HR large Zilla. The most obvious difference besides color is the head tilt. Both companies did produce the family in white or alabaster, so do pay attention next time you see a glossy alabaster PAF and pick it up to see if it is really a Zilla instead. 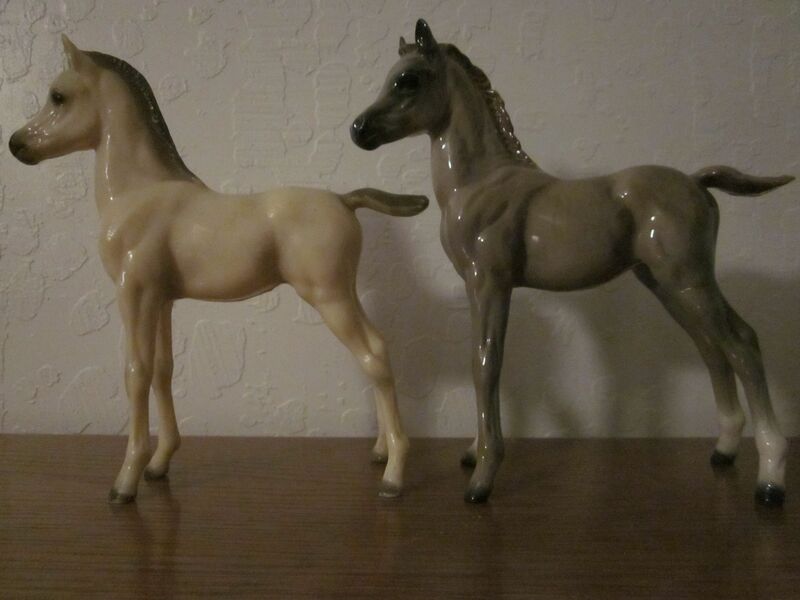 Sometime in the early 1970′s the two companies had a conversation and reached agreement about Breyer leasing these two horses plus 9 classic family molds, 5 classic race horses and 16 stablemate molds (now known as the G1 horses). Thank you everyone for sharing. The world of the Breyer horse is very interesting to say the least. I didn't have a big collection, but I sold my Breyers at a garage sale. I sold a lot of "horsey-girlie" stuff a couple of years ago. I felt certain stuff I had as a child needed to be "loved" by a new horsey girl and I did sell most of the things to one parent for her horse loving daughter. I have no children and my four nieces aren't into horses….although I tried really hard to turn, at least one, into a horse lover. I gave up on them, but now I am working hard on the next generation, the great nieces; hoping to create a horse lover so I have someone I can pass my equine things onto. Almost every gift I buy for these little girls has a horse theme (sometimes a dog theme). Crossing my fingers. ALERT Zenyatta halter listed on ebay!! Here are paintings i have in my room that my dad got at an antiques sale. No idea who the horses are, it doesnt say. This tapestry has been in my household since i was a baby. It was given to my mom. I also have the original Misty and Stormy breyers, unfortunately they were taken from me one day by my aunt. Ive had them since i was little they were created with texture, meaning they had a curly winter coat texture in their molds. Never have seen that in any other breyer. Interesting info on Misty and her foals that i have found. Had no idea she was stuffed and put on display along with Stormy! I would say Big Red for the chestnut because of the stockings, but the star and stripe is a little bit too big. It would also have been a younger Big Red since his neck doesn't have the thick "stallion" neck that he had when he was older. Nah, not Big Red. If you look closely the horse has a bold blaze, Sec had a narrow blaze, really a star and stripe he had. I apologize for being misunderstood, I'm in agreement with you. The horse looks like Big Red, but I have questions about the blaze, it looks to big to be Big Red. But then again, it's the artist's interpretation. The other one looks like Noor, but he had a star and not a blaze.